Shopping is a satisfying endeavor so it is the responsibility of Insiteur to make sure it is rewarding by upholding certain ethical standards. Every company should consider taking the step towards much development and e-commerce would be an predetermined course for a company growth and the value of production. MIAMI, FL, July 10, 2018 /24-7PressRelease/ -- Insiteur is a business that endorse shopping on the internet, it is a portal to lifestyles, experiences and searches to provide understanding to an inquiry. When someone visits www.insiteur.com a fulfilling implication is provided for that person that can be in form of needs and wants. The activities is of a top quality with variables that includes other areas of interest to the core perspective. The organization builds on the status of the internet and the objective is an extraordinary output for consumers in all extent. Insiteur provides substantial information on the homepage, there are also additional guidelines to the business such as checking email, press relations and contact information. The process is easy as it is web based, simply log on to the website and use as designated whether for individual or business purposes. E-commerce is opening the online shopping experience for a business that demand the instance for customers to have the ability to make purchases over the internet. It is an improvement to be reckoned with, it makes more transaction possible for business and allow customers to comfortably correspond to shopping therefore creates more sales in an industry or for a business whether online based or not. By adding e-commerce to a portfolio it increase the pace of expansion with more guarantees for sales while having a better maintenance of the overall operations process. Every company should consider taking the step towards much development and e-commerce would be an predetermined course for a company growth and the value of production. As an online company goods are bought and delivered to a home or business. A marketing strategy is to provide customers with free shipping, it is not always completely free, sometimes it comes with a quality purchase by spending a certain amount of money. Companies compete this way to show a level of assurance to maintain and get new customers. It is a growth elements for the business infrastructure therefore integrated it into the plan for success and development. Shipping is not free for the company but by having a relationship with courier services cuts cost and can be offered as a free service to users online. Insiteur aims to include a variety of occasions that is momentous to people events throughout the year. Timing is very important since goods need time to be delivered, however e-commerce is an innovative transaction that is constantly being researched to reduce the time of delivery, theft, damages, wrong orders and to lower prices. The circumstance of shopping is of the utmost importance therefore Insiteur indulge in the opportunity to provide a far more appreciation to reduce problematic occurrences. The features content is always filled with online sales and discount shopping. Especially in a way that is already focused as a substantial request before hand. 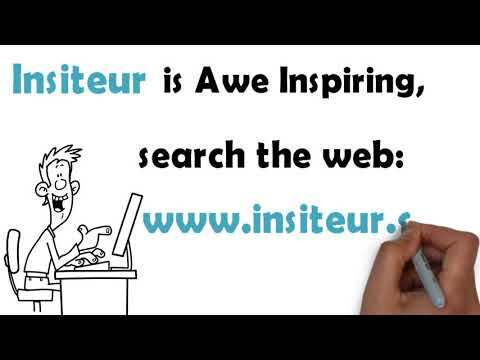 Instead of visiting a number of website trying to buy something, Insiteur makes it easy to decide upon the purchase, also understand that the decision comes from extensive study surrounded by facts to establish content that is presented on www.insiteur.com. Changes are often made to update to coincide with the visitors demands that is presumed to be in the community of interest and is a put together plan of solid contrast that users can believe in and broadens a collective family of e-commerce companies. Insiteur gives confidence with the authority to shop respectfully through a simplistic ordeal showing that it is a commendable website for everyone to confide in and use as a preferred method of shopping.